Here is a short, very helpful work from a Puritan writer in their typical form: highly practical and scriptural. Read this along with meditating on and memorizing Matthew 5:8. 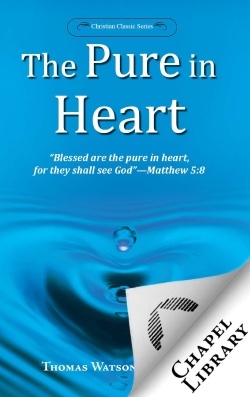 The Pure in Heart is excerpted from Thomas Watson’s classic work, The Beatitudes, written in 1660. In the experiential style of the Puritans, he examines in part one the nature, reasons and motives for, signs of, and how to attain heart-purity. Then in part two he wonderfully describes the blessings of the pure in heart: what it shall be like to see God! Thomas Watson was born approximately 1620, and died in 1686. Educated at Cambridge, he served as lecturer and then rector at St. Stephens in the Church of England. He was imprisoned in 1651 and ejected in 1662 for non-conformity to the Church’s erroneous practices. He continued to serve God’s people in several congregations thereafter. Watson became a well-respected Puritan preacher in his day, and a prolific author. His works include A Body of Divinity, The Lord’s Prayer, The Ten Commandments, Heaven Taken by Storm, and numerous others.